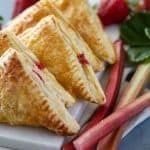 These turnovers are full of fresh rhubarb and strawberry flavor! In a small pan combine rhubarb, strawberries, sugar, and lemon juice over medium low heat. Cover and cook fruit for about 8-10 minutes, stirring occasionally. Remove from heat and cool to room temp. Preheat oven to 400 degrees. Line 2 large baking sheets with parchment paper or foil that is lightly sprayed with non-stick cooking spray. Whisk egg yolk and water together; set aside. Unfold puff pastry sheets, then trim each sheet into a square. Cut each large square into 4 even smaller squares. Spoon strawberry rhubarb mixture onto the center of each squares. Baste the edges of the puff pastry squares with egg wash. Fold the puff pastry diagonally over the mixture and seal by pressing the edges with a fork. Place turnovers on a baking sheet, leaving about 1 inch between them. Baste entire triangle with egg wash, then sprinkle with sugar. Bake for 20 minutes or until turnovers are puffed and golden.